Student Entertainment Events and campus radio station WMUC are hosting a contest between student-run bands to find this year’s Art Attack opener. During today’s final round of Battle of the Bands the three finalists, The Hip-Hop Orchestra, HYERLearnin and The Orthobox, will perform for a panel of SEE and WMUC judges. Lead singer Matt Gomez of the band Sons Of The Radio, will pose as a special guest judge. After his former drum teacher played during Art Attack in 2012, sophomore physics major Kevin Lehr knew he wanted to perform for the same audience. Lehr is one of the three members of Talk Radio, an indie, alternative and “college” rock band. The band’s name stems from its roots: Lehr met singer/bassist/guitarist Mike Houser at WMUC. They started as Public Access, then became Public Radio and finally evolved to Talk Radio which stuck, Lehr said. Talk Radio practices at least once a week and plays gigs almost every weekend, said guitarist and singer Devin Ganey. 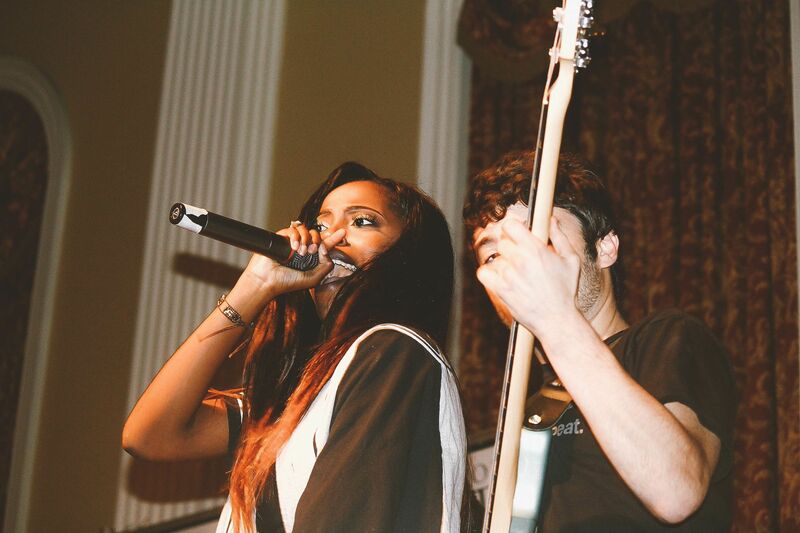 Radio performs at several campus functions and venues in the area, such as the Velvet Lounge in Washington, D.C. Although none of the band members major in music, Ganey said they hope Talk Radio perseveres throughout the remainder of the competition. Art Attack would also offer a professional platform for performance, Lehr said. Talk Radio is no longer in the competition for Battle of the Bands. It started as a vision for Marcus Moody: a group that incorporates hip-hop sound with the classical. This vision evolved from three or four students to a group of more than 20 musicians, said senior animal science major Johnny Weiss. The Hip-Hop Orchestra now includes instrumentalists on various instruments including the drums, strings, horns, keyboards and guitars. “We’re evolving more into a student group than a traditional band,” Weiss said. The group recently began collaborating with a group of rappers from Towson, but still performs with David “Paper Boy” Porter, Weiss said. The Hip-Hop Orchestra performs mostly original pieces that are hard to categorize, Weiss said. They are hip-hop-style songs with a lot of string instruments and horns. Moody writes all of the group’s music, including a mashup of Kanye West and Kendrick Lamar pieces, Weiss said. “The easiest way to describe our sound is hip-hop with classical elements,” Weiss said. This year’s lineup for Art Attack includes Jessie J, The Chainsmokers and Logic, an array of sounds giving Art Attack XXXII more of a festival vibe rather than a typical concert, Weiss said. Performing a verse with D-Cal at Art Attack XXXII wasn’t enough for junior government and politics major Opeyemi “O-Slice” Owoeye. The group formed when O-Slice was in high school. O-Slice said she wanted to create a network of individuals who could depend on each other, whether it be for pictures, video or singing. When it was established in 2011, HYERLearnin had five members, but has since prospered into to more than 10. Even with more than 30 on-campus performances under her belt, O-Slice said performing at Art Attack would be one of the most interesting opportunities she’s had while at the university. Performing at Art Attack would bring her one step closer to her dream, she said, and would help fulfill the purpose of HYERLearnin. HYERLearnin is about the idea that if you keep going, working hard and pushing, you will reach your dream, O-Slice said. As a band comprised of varying music tastes, Bare Left prides itself on its “eclectic and psychedelic” sound. The instrumentation of the band lends insight to the nature of their sound: a guitar, bass, drums, keyboard and flute. The overlay of textures creates a unique tone, said singer and flutist Kai Keefe. Interestingly, Keefe, a junior broadcast journalism major, said, everyone in the band has very dissimilar tastes in music, which is both a blessing and a curse. While the many influences give the band a unique sound, it’s occasionally difficult to arrive to a consensus when making musical decisions, Keefe said. Keefe works at WMUC as one of the recording engineers. WMUC brings in live bands pretty regularly, Keefe said, to put on shows in the studio, which has allowed Bare Left the opportunity of performing at the station. Like the other groups, Bare Left agrees playing at Art Attack would give them exposure to the campus community that not many other venues will. Bare Left did not advance to the final round of Battle of the Bands. The winner will be chosen after the three semi-finalists – HYERLearnin, The Hip-Hop Orchestra and The Orthobox – perform again for a panel of judges. In the event of a tie, audience members will be asked to vote for the winner. The final round commences at 7 p.m. in Stamp’s Baltimore Room. Maya Pottiger is a sophomore journalism major and can be reached at mayabee777@aim.com.